In previous articles, we defined different building solutions to prevent radon gas from entering into new buildings. In the case of dealing with the problem of radon in already built constructions, there are two ways of fighting it: ventilation or insulation. Polyurethane's characteristics turn it into an optimal material for the insulation of a building. Its durability is the basis of its properties against environmental agents, which make it stand above its competitors in the field of insulation materials. 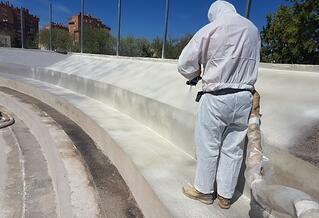 Polyurethane foams are used daily in many forms at the home, the office or on leisure and sports facilities. This widespread use is due to the excellent thermal performance and airtightness achieved with spray foam insulation. There are different regulations establishing the measures to guarantee health and safety inside a building. Usually, protection against radon has its own section.